for even the smallest publications. 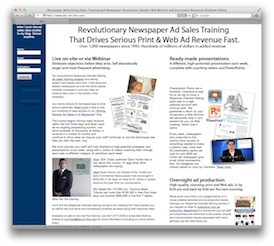 Want to see an easy way to close a major sale each week (and give your staff some of the best print and online ad sales training around)? Join us this Thursday, March 7th, at 12 noon EST for a 30-minute demonstration of our Presentation Packs service. You'll quickly get an overview of one of the most cost-effective ways to drive serious print and digital revenue fast. It's a combination of ongoing live training, weekly coaching videos, and custom-made presentations that's like you have your own full-time advertising training manager and new business development manager wrapped up into one very affordable package. Most are presentations I've personally made and helped sell multiple times for various clients on contracts around $15,000 each, so these aren't just academic exercises. It starts with live training (available every month for anyone who comes on board after the initial training) on our award-winning ad sales techniques (via Webinar) as well as access to one of the industry's most popular new hires ad sales courses. Plus, each week, your ad staff receives everything they need to make a high-potential sale to a specific category, including PowerPoint/Keynote files, new videos that walk the ad rep through the entire sales process specifically for each category, and, of course, a stunning and highly effective ad you can quickly customize for your prospects (and recycle if they don't buy). They even have personal access to me if they need a little more coaching or direct help selling a prospect. It's really worth a look if you have 30 minutes. With all that managers and ad reps have to do in a day, we find that two things get pushed to the bottom of their "to do" list. First, managers just don't have the time to coach. And second, most ad reps don't have the time (or inclination) to do their pre-presentation homework, analysis, and all that back-and-forth with a designer to develop a solid strategy. So, often, the really serious prospecting just doesn't get done. These Presentation Packs help with that in a big way. As one ad rep who sold a $25,000 contract from the first Pack said, "If you can set me up like this, I'll knock them down." Drop me an email if you want to take a look either in the session or privately. Or if you're reading this after the session, contact me and I can give you more information and take you through a private demo. Presentation Packs involve a $2,500 "entry fee" then a $250 monthly fee after that. They come with a guarantee, too: If you're not making money from them, I'll sell them for you via Webinar. Again, most of these ads I've personally sold in multiple markets already. If you're a newspaper owner, publisher, general manager, or ad manager e-mail me or call (631) 477-2505 if you'd like to attend. If nothing else, you'll see how other newspapers are leveraging their limited resources to drive major print and digital revenue fast.